Looking back on my childhood I realize now that I grew up a closeted member of the Mormon church. I was often the only Mormon in my grade in Kentucky and I often tried to keep that information to myself. 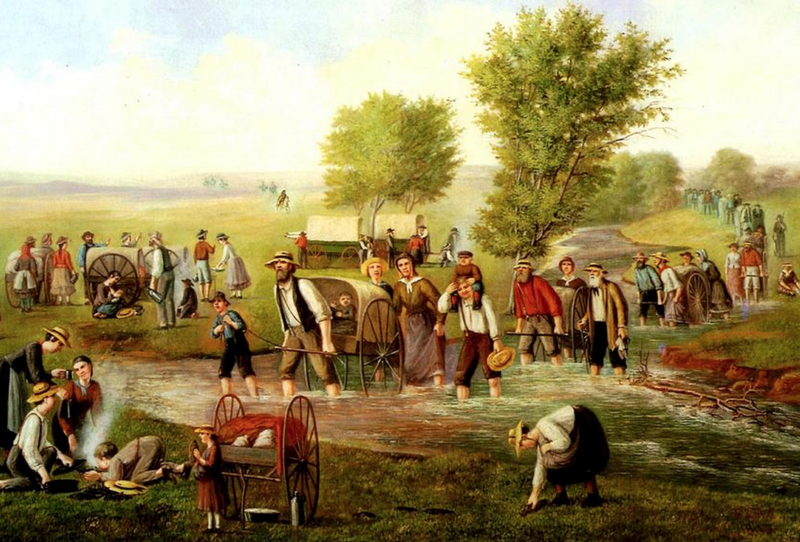 The Christensen painting above was always in our civics books and I can remember sweating through the lesson on the Oregon Trail and the Mormon migration in fear that attention would be pointed at me. Like many kids for many different reasons I didn’t want to be different. Not only does the painting above bring back these grade school memories, it also brings back my opinion—even at that age—that his paintings were not very good. There seems to be a real problem with scale. The girl in the foreground, for example looks to be descended from hobbits. Born in Copenhagen and trained at the Royal Danish Academy of Fine Arts, he converted in 1850 and eventually migrated to Utah. “The panorama came to national prominence in 1970 with a showing at New York City’s Whitney Museum of American Art and a special issue of Art in America. 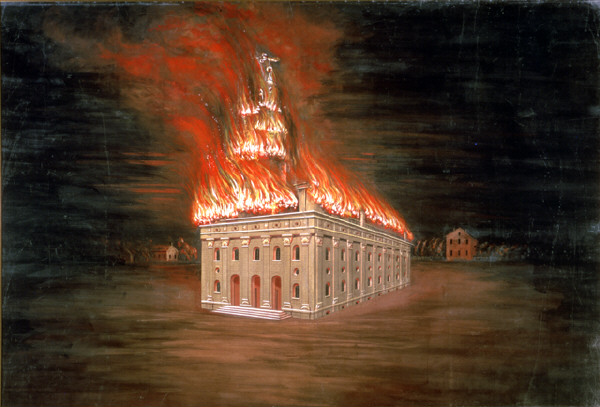 It has since been displayed in many American art museums, ” Paul L. Anderson and Richard Jensen wrote on LDS.org. The exhibit will run June 4 to October 3, 2015. 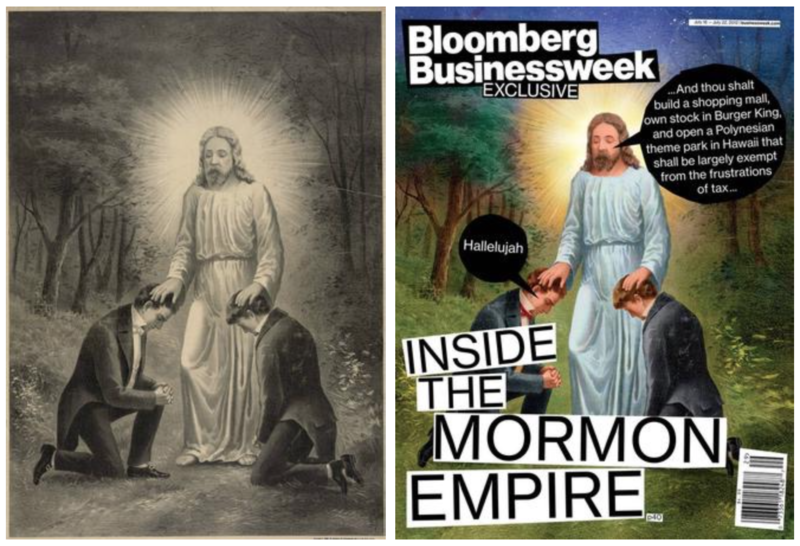 A controversial chapter in the history of Christensen’s work was the 2012 cover of Bloomberg Businessweek that satirized one of his prints for a story on Mormon church finances. 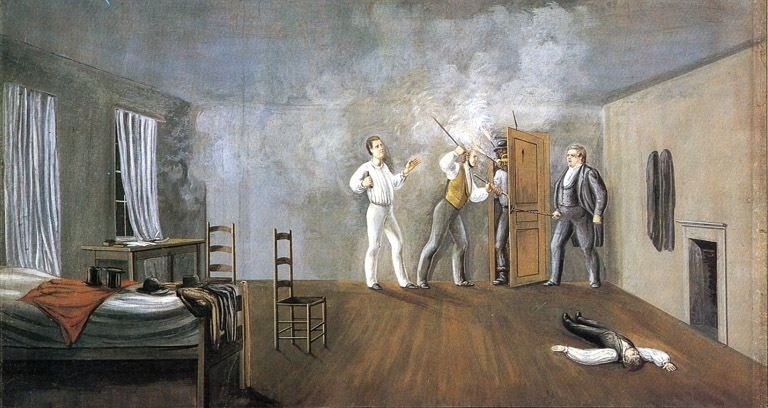 “We looked into paintings of what is referred to as the First Vision, which is when Joseph Smith went into the woods and had a revelation, and since that moment founded Mormonism,” explained Robert Vargas, the art director of the magazine. Amusingly, the image below is not of the First Vision and not even of God. This visitation is by John the Baptist almost a decade after the First Vision. Images courtesy Wikimedia, Bloomberg, and DeseretNews.com.